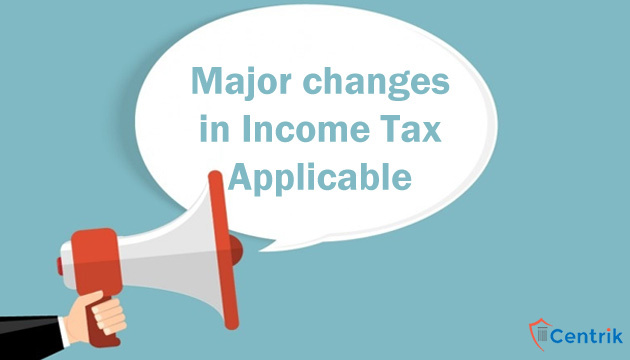 The government made numerous improvements in taxation which are applicable from 1st April 2018. The following are a portion of change which can impact the common-man. Government reintroduced 10% tax on long-term capital gains above Rs 1 lakh from listed shares and equity-oriented mutual funds from 1st April 2018. Before insertion of this provision long-term capital gains from the sale of equity shares and equity-oriented mutual funds on which securities transaction tax (STT) has been charged on sell transactions are completely exempt from tax. This means that any gains from sale of equity shares or mutual funds held for more than a year are not subject to any kind of tax whatsoever. Dividend distribution tax on equity-oriented mutual funds at the rate of 10% percent will be applicable for FY 2018-19. The salaried class was given a small boost with a standard deduction of Rs 40,000, replacing the transport allowance and medical reimbursement. Cess on income tax from 3% to 4% thereby increasing the tax payable by all categories of tax payers. Section 80TTB provides to allow a deduction up to Rs 50,000 in respect of interest income from deposits held by senior citizens. 6. Introduction of e-assessment from 2018-19 to minimize interface between tax department and taxpayer. Section 143(3) of the I-T Act empowers the Assessing Officer to make an assessment of total income or loss of the assessee, and determine the sum payable by him or refund of any amount due to him on the basis of such assessment. Deduction on TDS under section 194A on interest income for senior citizens has increased from Rs 10,000 to Rs 50,000. Deduction on a premium of medical insurance under Section 80D was also increased to Rs 50,000 from current Rs 30,000 for senior citizens. The deduction limit for medical expenditure in respect of certain critical illness also raised to Rs1 lakh from, Rs 60,000 in case of senior citizens and from Rs 80,000 in case of very senior citizens, under section 80DDB. The government had reduced the corporate tax to 25% from 30% fo companies with a turnover of Rs 250 crore. Currently this rate is available for companies with turnover of less than 50 crore.